If you have a question about the pokies there is a good chance that is answered here. Below we have all of the most frequently asked questions with answers based only on the facts. Many of the questions below show you how virtually all of the myths are false. After reading this section you should have a better understanding of gaming machines which should give you a few things to think about next time you are spinning away. Where did the name "pokies" come from? What is the average payout percentage on a poker machine? Can the pub change the payout percentage each day? Do the odds change depending on how much I bet? Are there any tricks to winning? Is it better to play in pubs, clubs or casinos? Where can I buy a pokie machine to play at home? Do new machines give a better chance of winning? Should I try to double up my wins with the gamble feature? Is there a better time of day to win? Do the machines have hot and cold cycles? Can you tell if a machine is going to pay out based on the symbols? Why do I always seem to get just one symbol off from the big wins? What's better to play, dollar machines or one cent machines? How can I find the games with the highest payout percentage? How do the pub progressives work? Why is there a $10,000 win limit in pubs? How do you find out the sequence for the double ups? 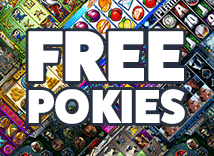 Where can I play pokies for free? While there is really no documentation of where the term originated like most slang it most likely came from players shortening poker machines with phrases such as "I'm down at the pub having a spin on the pokies". In Australia the lowest payout percentage by law can be 87%. In reality though you will find that the average comes in at just over 90%. For short term play it does not really make a major difference. No. The pay back for each machine is fixed at a certain level when the EPROM is manufactured. This cannot be changed by gaming room operators unless they order a new chip for the machine. In some states (Queensland for example) the game RTP's are set remotely at the monitoring system. In this case an operator can change the RTP of games at any time with approval of the regulator. No. Every spin on a gaming machine has exactly the same chance of winning as the spin before and the next spin. The machine does not take any notice of how much money has been played through. No. The odds of winning are always the same. They do not change if you bet one cent per spin or bet five dollars. If you play less than maximum lines you will however miss out on the wins on the lines you didn't bet on. No. There is absolutely nothing that you can do to increase your odds of winning when playing the pokies. While there are some people selling systems they are all scams and are a waste of your hard earned money. In general your best bet is to play at a casino. This is because not only can you win bigger prizes but because casinos have player VIP programs where you can get addition things such as free rooms, food, etc. It is currently illegal in all states and territories in Australia to own a gaming machine without having a gaming machine license. As fun as it would be to have your very own game it is not an option at the moment. This is a bit of a gray area. It does appear that when a machine is first installed that the game will have a better pay back for the first day of use. While the reason for this is not known it does seem to be a fact. It is up to you. If you like the double feature then by all means give it a shot. This type of bet has no house advantage and can be a quick way to turn a small win into a big pay off. No. Pokies do not change depending on whether you play them in the morning,the afternoon or the night. They simply pick five numbers every time you press spin and show you what comes up on the reels. While at times it appears that they do this is more of your mind playing tricks on you. Each spin has exactly the same chance of winning no matter when you press the button. There are no up or down cycles. This seems to be quite a popular myth. There is no way to predict what a machine will do based on the symbols that are on the reels before you play. What you see is simply the last spin that was played. As there are more lower paying symbols on the reels and as these symbols tend to be above and below the better paying symbols the machines are set up in such a way that this will naturally happen. That all depends on your budget. If you're spending $10 then playing a dollar machine is probably not a great idea. In general however you will find that the higher denomination games have higher pay backs. There is no way to tell by looking at a game. You can try asking a casino or gaming room employee but it is unlikely they will tell you. In reality even finding the best games does not mean a guaranteed win every time. The system selects a jackpot value and the first player who pushes the jackpot over this value wins the prize. This is why you will find that people betting big seem to win the jackpot most of the time. The reason for this is to minimize the players who are chasing a big win. If the jackpots were $1,000,000 many more people would lose more than they can afford. It also protects gaming venues from big losses. Contrary to popular belief the results of the double up feature are totally random. There is no in built sequence for the suits or red / black. If there was it would be too easy for players to continually win. You can play the majority of the games reviewed here at OnlinePokies.com for free at the casinos listed below the reviews. The only exception to this is the progressive games which are real money only. If you have a question that was not answered or want to discuss any of the answers please feel free to Contact Us and we will be happy to assist you.